They hope our fear of economic loss if we don’t approve these pipelines, is greater than our fear of environmental, social and cultural harm if we do. The real picture is that if we accept bitumen export pipelines it will not only bring with it significant environmental, social and cultural harm, but economic harm as well. A full and proper accounting of the impact of rapid bitumen extraction and export tells us all Canadians end up on the same side—a side that says we can’t afford to allow these bitumen export pipelines to be built. puts our terrestrial and marine based ecologies directly in harms way. To put it simply: when it comes to non-renewable resources, rapid extraction and export of raw bitumen is not economic development. Development means enhancement, value added, improvement—some form of contributing to a better state because of economic activity. There are essentially two things you can do with bitumen once it comes out of the ground. Upgrade it to Synthetic Crude Oil—SCO—so it can be processed in a refinery and become petroleum products like gasoline and jet fuel. This is the value chain that benefits Canada and our economy. Or:You can dilute bitumen with a substance, like imported condensate, to enable it to move down a pipeline for upgrading and refining in foreign markets. This is not development—it is exploitation. This approach will deliver a worsened economic, social, environmental and cultural reality to BC, Alberta, and Canada. That is the truth and it is not anti-business, or anti-industry. It is fact. If you extract and export raw bitumen diluted with condensate, only 35 percent of the value of our resources is captured within our economy—the rest of the value is shipped down the pipeline along with the jobs and environmental standards, along with the wealth and government revenue. Upgrading bitumen captures roughly 70 percent of the value of oil sands heavy crude. In addition to sending meaningful jobs, wealth, and environmental standards down bitumen export pipelines, the oil industry plans to charge us more for essential petroleum products. For almost two years, Enbridge told us the benefits from Northern Gateway would come from higher prices paid in Asia for our oil. Pipeline proponents and elected leaders like Minister of Natural Resources Joe Oliver, told us this would contribute economic benefits to Canada. 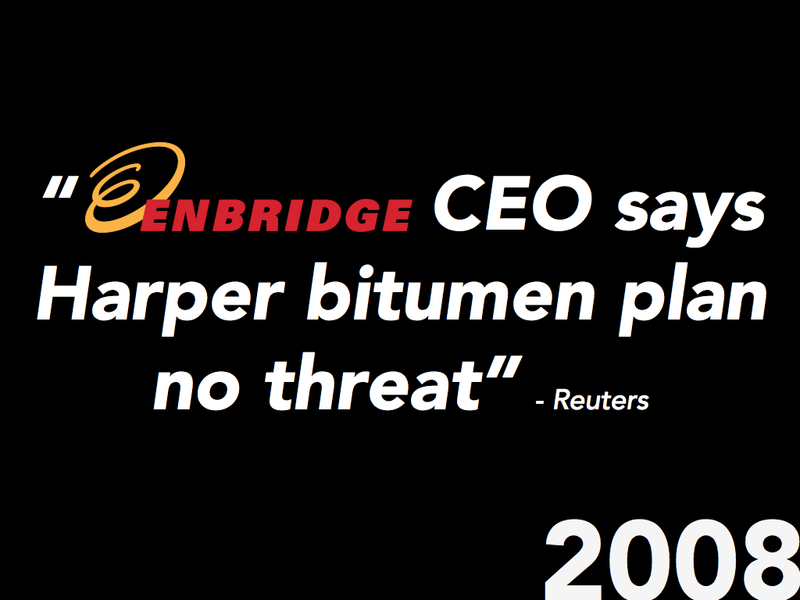 The information on this slide comes from Enbridge. It was provided to investors and analysts at a recent investor conference. What Enbridge told investors is that when access to Asia is achieved, prices on all barrels of heavy oil will go up to $108 per barrel. When refineries pay higher prices for their feedstock, they pass these price increases on. That’s the primary purpose behind accessing new markets—get the highest price possible for one barrel and pass it onto all barrels. According to the prices in this slide, Enbridge is telling us that when Northern Gateway is built, we can expect prices at Canadian pumps to go up by about 5 cents a litre—and the only reason they will go up by 5 cents a litre is because Northern Gateway is built. So whenever we are told access to foreign markets secures higher prices for our crude and this benefits Canada, we also need to be aware that oil producers plan to charge those higher prices on every barrel they produce. And when they do, their refineries pass it onto us right here in Canada. The market access Canadians need for western Canadian crude is getting it to eastern Canadian refineries. That’s a demand of about 750,000 barrels a day. Refineries in eastern Canada pay higher prices for their imports because they are priced off an international benchmark called Brent. 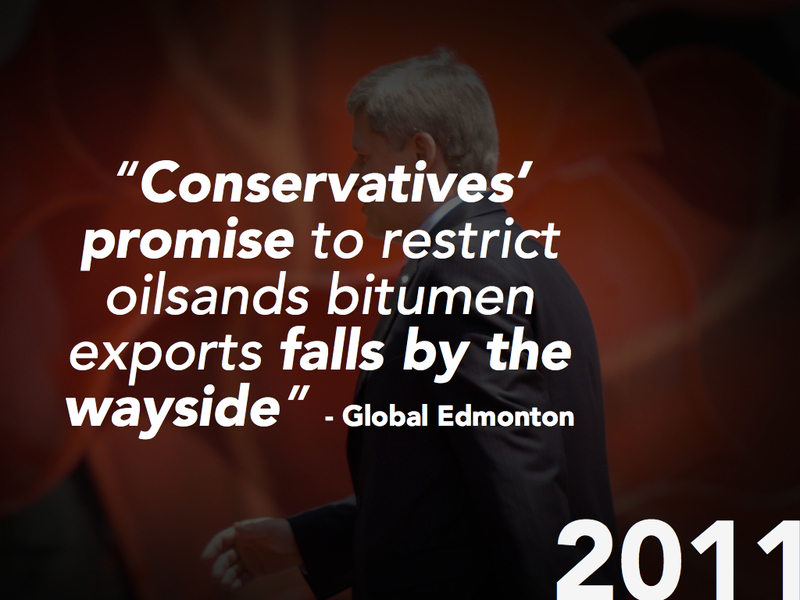 But, most Canadian refineries, especially in the east, cannot process oil sands bitumen. This means it needs to be upgraded in Alberta to Synthetic Crude Oil—into SCO where it becomes very close to Edmonton Light and can be used in eastern Canadian refineries. TransCanada has just entered into an open season to see if oil producers want to ship oil on their pipeline from Alberta to Atlantic Canada. But if this pipeline transports diluted bitumen it presents the same economic problems as Northern Gateway, TransMountain’s twin, and Keystone XL. If diluted bitumen is shipped eastward its intended for export and Canadians will continue to be price-gouged at the pumps. Trans Canada’s pipeline proposal becomes just another escape route out of Canada for oil companies so they can avoid upgrading bitumen in Canada. Traditionally, Alberta upgraded about 60% of the bitumen pulled out of the ground. In 2007 the Alberta government promised the rate would rise to 72% bringing with it the benefits of value added, meaningful jobs, and greater tax revenue. In the US investments in upgrading and refining were made—including investments made by Canadian oil producers such as Cenvous, Husky, and French multinational Total. 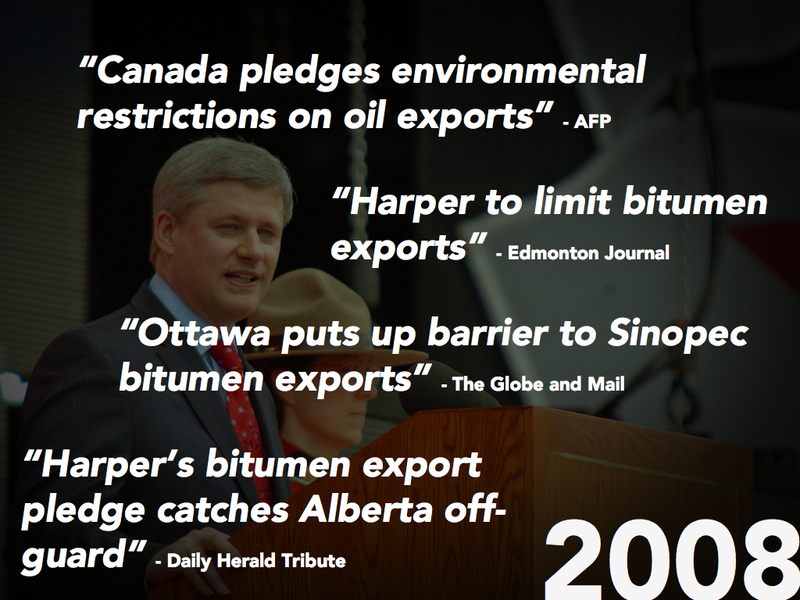 These investments were made to accept Canada’s bitumen. And we all know China’s refineries—owned by the Chinese government through their National Oil Companies—want our bitumen. 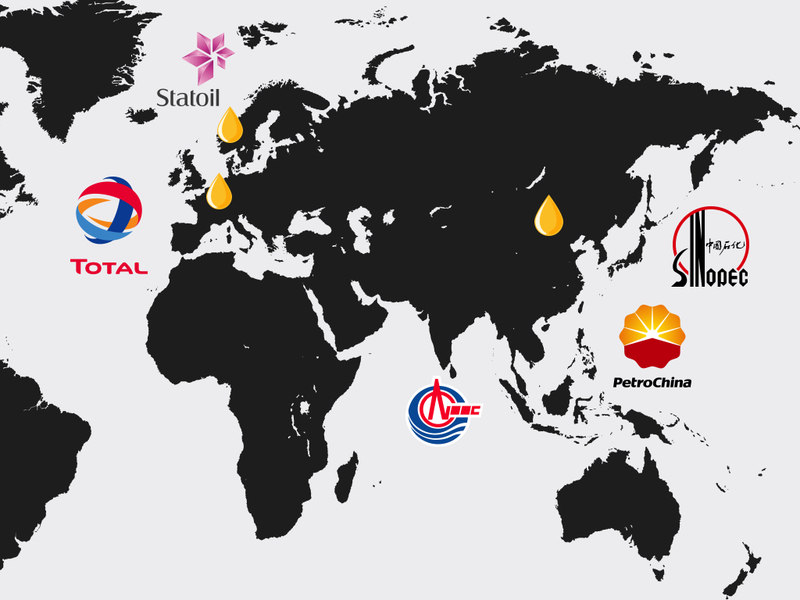 These National Oil Companies, which began buying the rights to our oil in 2005, are all oil producers in Canada and want to take the bitumen value added back home to Asia. Big oil’s decisions to enhance refineries in the US to accept our bitumen, and plan to do the same in Asia, has already started to hollow out Alberta’s resource sector. The percentage of bitumen upgraded in the province has begun to decline. By 2017, Alberta will only upgrade 48% of the bitumen it produces and by 2025 it will be less than 40%. That’s a long way away from where we would have been when Alberta promised 72% of the bitumen would be upgraded in Alberta by 2016. Because bitumen is so dense, like tar or wet cement, in order for it to flow down a pipeline it requires diluent, like condensate. Up until 2005 Canada was self-sufficient in condensate production. When we produced a barrel of bitumen and mixed it with domestically produced condensate to make diluted bitumen, we exported a barrel of diluted bitumen—or what the industry refers to as dilbit. By 2006, condensate demand began exceeding domestic supply and oil sands producers started importing it from the US. The rapid extraction and export of bitumen requires a growing import dependency on condensate. And, to import condensate you need pipelines. That’s why Enbridge reversed its Southern Lights oil export pipeline in 2010—to import condensate. That’s why Kinder Morgan is reversing Cochin pipeline to flow from Illinois in the US to Alberta. But the untold real clincher with big oil’s strategy—as if a growing reliance on imports from the Middle East is not enough—in order to export dilbit instead of upgrading bitumen in Alberta, more than twice the pipeline capacity is required. Because dilbit is denser than upgraded or conventional oil, it moves slower. So before we know it, twice the pipeline capacity is required to transport a barrel of dilbit than when bitumen is upgraded in Alberta to SCO. This is why for example, Kinder Morgan’s 300,000 barrel a day existing Trans Mountain pipeline—which ships about 60,000 barrels a day of diluted bitumen—can become a 400,000 barrels a day pipeline if they dedicate it to carry only light oil. Lighter oil like SCO, is less costly and quicker to move than diluted bitumen. Northern Gateway is intended to transport 525,000 barrels a day of crude oil and 193,000 barrels a day of condensate. This triggers an average of 220 Aframax, Suezmax and Very Large Crude Carriers—220 a year in the Douglas Channel and Hecate Straight. These are very large vessels—even the Aframax that now docks at Trans Mountain’s Burnaby facility is taller than the Shangri La—Vancouver’s tallest building. The capacity of Northern Gateway’s throughput, and the tanker traffic it triggers is pretty common knowledge. This capacity and tanker traffic is the scope of the environmental risk being reviewed by the National Energy Board. What is not commonly appreciated is that Northern Gateway has been designed to ship 60% more crude oil and 40% more condensate by simply adding pumping power. The supertankers needed to transport it? It’s not 220 a year, but closer to 340—almost two supertanker transits a day in BC’s northern coastal waters. If there are 60% more oil tankers there is more than a 60% increase in the risk of an oil spill. None of that risk is being considered in the current approval process for Northern Gateway, but capital expenditures to support expanded throughput are. The oil industry is counting on less scrutiny and rapid approval when they apply to significantly expand capacity. At the recent Kinder Morgan Toll Application Hearing, Suncor explained to Kinder Morgan that, Founding Shippers on Northern Gateway can: compel expansion; that it has been commercially contemplated; and is expected to be more efficient because its a streamlined regulatory process. Until 2005, TransMountain pipeline capacity was 225,000 barrels a day. In 2006 they applied for expanded capacity to 300,000 barrels a day under a streamlined environmental screening process. A growth in oil tanker traffic in Burrard Inlet was triggered. The number of oil tankers through English Bay has increased three fold since Kinder Morgan expanded Trans Mountain’s pipeline capacity. Potential costs from a spill have not been appropriately calculated, and adequate financial resources to compensate for a spill have not been assured. The current economic risk from the existing Trans Mountain system is extensive and British Columbians are exposed to unnecessary risk. Now, Kinder Morgan plans to twin Trans Mountain and they have told us their new pipeline will ship 540,000 barrels a day of diluted bitumen triggering 408 tankers a year. This proposed new pipeline is a 36” diameter pipeline—the same diameter as Northern Gateway’s proposed oil pipeline. It is possible that the proposed Trans Mountain twin has designed capacity much greater than what we are being led to believe. If this new pipeline can move up to 850,000 barrels a day as Northern Gateway can, this would mean the oil pipeline system flowing into the lower mainland of BC could accommodate over 1.2 million barrels a day of crude oil. That volume would mean either more supertankers—or bigger supertankers—or both. We know in 2011 Kinder Morgan planned to dredge Burrard Inlet to accommodate Suezmax supertankers which can ship about 25% more oil than Aframax—because they are bigger. It becomes very important later this year when Kinder Morgan applies for approval to build Trans Mountain’s twin that the risk of the existing pipeline and the full designed capacity and risk of this capacity be the scope of the review—not just the capacity Kinder Morgan wants us to see. 1. Decades of higher oil prices for Canadian consumers and businesses across the country. 2. Lost opportunity to add value, create meaningful jobs and control environmental standards here at home. 3. Hollowing out of the oil sector as raw bitumen exports take precedence over upgrading and refining. 4. Continued reliance on foreign oil imports through eastern Canada. 5. A growing dependence on foreign condensate imports through western Canada. 6. Crowding-out of BC’s legitimate and vibrant economic activity. 7. Twice the number of pipelines and double the tanker traffic to move diluted bitumen as compared to upgraded bitumen. 8. More than twice the environmental risk and related costs. 9. As soon as Northern Gateway and TransMountain are approved, more pipeline capacity will be demanded. 10. Supernatural British Columbia becomes a Supertanker terminal for Alberta. Big oil’s corporate rapid extraction and export strategy makes no economic sense. Crude oil pipelines through British Columbia make no economic sense. Oil tankers make no economic sense. We need to develop an energy policy in Canada, Made-in-Canada, for and by Canadians.